The danger isn’t that Trump will build an autocracy. It’s that congressional Republicans will let him. There is nothing about the Trump administration that should threaten America’s system of government. The Founding Fathers were realistic about the presence and popularity of demagogues. The tendency of political systems to slip into autocracy weighed heavily on their minds. That power corrupts, and that power can be leveraged to amass more power, was a familiar idea. The political system the founders built is designed to withstand these pressures, and to a large extent, it has. So why, then, are we surrounded by articles worrying over America’s descent into fascism or autocracy? There are two reasons, and Trump is, by far, the less dangerous of them. Trump has shown himself unconcerned with the norms of American democracy. He routinely proclaims elections rigged, facts false, the media crooked, and his opponents corrupt. During the campaign, he flouted basic traditions of transparency and threatened to jail his opponent. His tendencies toward nepotism, crony capitalism, and vengeance unnerve. His oft-stated admiration for authoritarians in other countries — including, but not limited to, Vladimir Putin — speaks to his yearning for power. Amid all that, David Frum’s Atlantic cover story, “How to Build an Autocracy,” is a chilling read. “We are living through the most dangerous challenge to the free government of the United States that anyone alive has encountered,” he writes. The argument works because its component parts are so plausible. Frum does not imagine a coup or a crisis. He does not lean on the deus ex machina of a terrorist attack or a failed assassination attempt. The picture he paints is not one in which everything is different, but one in which everything is the same. 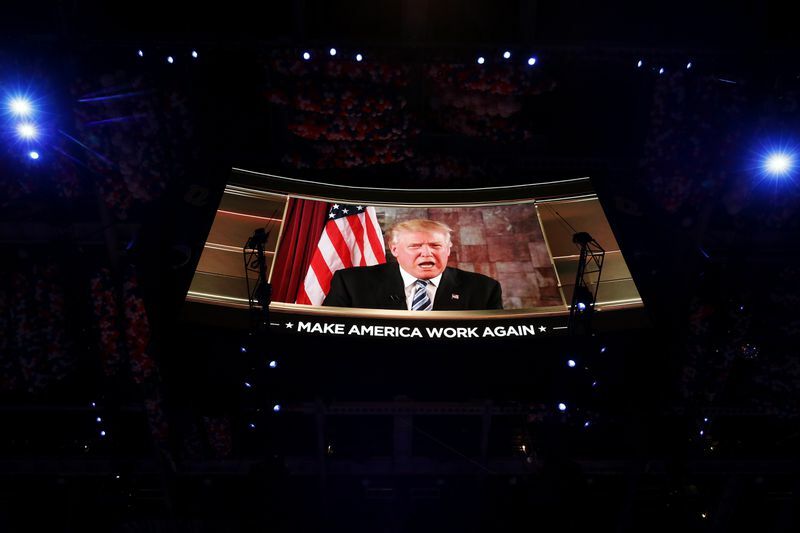 He imagines a Trumpian autocracy built upon the most ordinary of foundations: a growing economy, a cynical public, a cowed media, a self-interested business community, and a compliant Republican Party. The picture resonates because it combines two forces many sense at work — Trump’s will to power and the fecklessness of the institutions meant to stop him — into one future everyone fears: autocracy in America. I am a critic of America’s system of government. For all its genius, I believe it is more fragile, and less sensible, than civics textbooks admit. I think the profusion of veto points makes governance too difficult, the disproportionate power given to small states is indefensible, and the absence of any mechanism to resolve conflicts between different branches is dangerous. But the danger of a demagogic, aspirational autocrat winning the White House is one problem the Madisonian constitutional order is exquisitely designed to handle. The founders feared charismatic populists, they worried over would-be monarchs, and so they designed a system of government meant to frustrate them. The system showed its power this weekend, when Judge James Robart of the Western District of Washington issued a temporary restraining order freezing enforcement of Trump’s immigrant and refugee ban. Trump raged before the ruling — “if something happens blame [Robart] and court system,” he tweeted — but his administration complied with it. The spectacle of the president of the United States seeing his signature program stopped by a district judge in Washington state ruled is a reminder of how many veto points the system contains. The judiciary, however, is not the branch of government with the most power or the most responsibility to curb Trump’s worst instincts. That designation belongs to the US Congress. The president can do little without Congress’s express permission. He cannot raise money. He cannot declare war. He cannot even staff his government. If Congress, tomorrow, wanted to compel Trump to release his tax returns, they could. If Congress, tomorrow, wanted to impeach Trump unless he agreed to turn his assets over to a blind trust, they could. If Congress, tomorrow, wanted to take Trump’s power to choose who can and cannot enter the country, they could. As Frum writes, “Congress can protect the American system from an overbearing president.” He just thinks they won’t. Frum offers a persuasive account of why congressional Republicans are likely to fall before Trump’s will, and he is probably right. But I want to make the argument that there is nothing inevitable about that: it is not the system envisioned by the Constitution and it is not the system we would have if voters took Congress’s enormous power seriously and were as interested in who ran it as in who ran the presidency. And I want to shift the locus of responsibility a bit: if Trump builds an autocracy, his congressional enablers will, if anything, be more responsible than him. After all, in amassing power and breaking troublesome norms, Trump will be doing what the Founders expected. But in letting any president do that, Congress will be violating the role they were built to play. We need to stop talking so much about what Trump will do and begin speaking in terms of what Congress lets him do. Donald Trump is a paper tiger. But the US Congress is a tiger that we pretend is made of paper. It is, at this point, taken for granted that congressional Republicans will protect their co-partisan at any cost. It is, at this point, expected that they will confirm Trump’s unqualified nominees, ignore his obvious conflicts of interest, overlook his dangerous comments, and rationalize his worst behavior. That expectation — and the cowardice it permits — is the real danger to American democracy. The framers of the Constitution were not infallible, and they were particularly wrong about a core feature of the government they built: They designed the American political system believing it would, uniquely, resist the creation and influence of political parties. It did not. The framers’ mistaken belief that America’s political system would resist organized parties was consequential. Their vision of American government — a vision children are still taught in civics classes — was that it would be balanced by competition among branches. The president, the courts, and the Congress would compete for power and prestige. They would check each other naturally, as a byproduct of exerting and protecting their authority. The reality of American government today is quite different. American politics is balanced by organized political parties competing across branches of government. The president is checked not by Congress, but by the opposition party in Congress. The courts remain more independent — Judge Robart, it’s worth noting, was appointed by President George W. Bush — but they are by no means untouched by partisan competition. Federal judges are selected through a political process driven by organized ideological groups that vet candidates with the goal of ensuring predictable, friendly rulings in the future. In normal times, this works well enough. These are not normal times. Congressional Republicans find themselves, or at least feel themselves, yoked to Donald Trump — an abnormal president who hijacked their primary system and mounted a hostile takeover of their party. Trump now holds them hostage: Their legislation requires his signature, their reelection requires his popularity, and he is willing to withhold both. But an absence of incentive should not be confused with an absence of responsibility. Trump does not, himself, have the power to reinforce his rule with a web of corruption. Trump does not, himself, have the power to launch fraudulent investigations of nonexistent voter fraud and then use the results to disenfranchise voters. Trump does not, himself, have the power to confirm his Cabinet while refusing to put his assets into a blind trust. In these cases, and others, Trump’s power exists at the pleasure of Congress. He can only do what they let him do. That Congress is not using its power is Congress’s fault, not Trump’s. Whatever danger Trump poses to the system is their fault as much or more than his — it is their job, after all, to check an out-of-control president. To put it differently, Trump deserves a bit less attention, and Rep. Jason Chaffetz deserves a lot more. 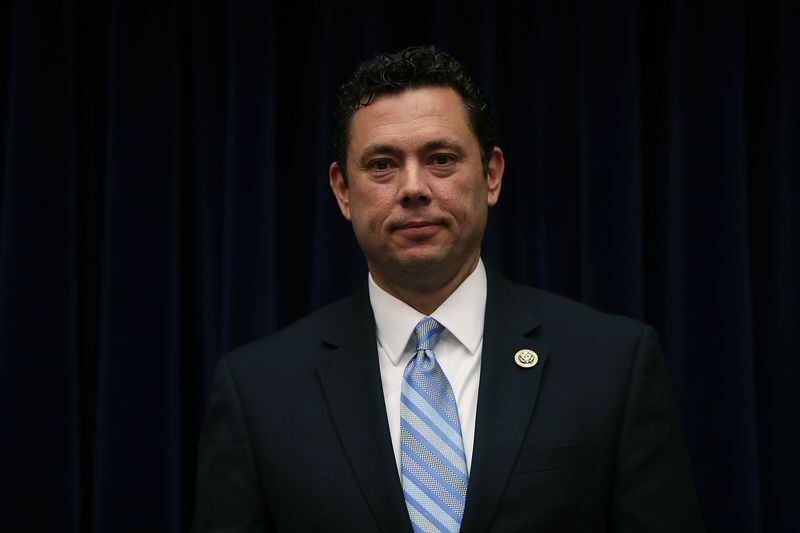 Jason Chaffetz, the Utah Republican who chairs the House Oversight Committee, is an eager investigator. He’s dug into Benghazi, Planned Parenthood, and Hillary Clinton’s emails. And he was no fan of Trump’s. “I can no longer in good conscience endorse this person for president,” he said shortly after the Access Hollywood tapes were released. The reason, he explained, was that he had a 15-year-old daughter, and he could not look in her the eye and defend what Trump said about women. Like other Republicans, Chaffetz ultimately decided that beating Hillary Clinton was worth overlooking Trump’s transgressions, and he returned, reluctantly, to the fold. But like other Republicans, Chaffetz expected Clinton to win the election. And he was ready. “Even before we get to Day One, we’ve got two years’ worth of material already lined up,” he said in October. So that was Chaffetz weeks before the 2016 election — ready to launch a years-long investigation into the next president over email server management. Last week, Chaffetz released the House Oversight Committee’s agenda for the next two years. It lists 43 items — none of which involve Donald Trump. Actually, that’s not quite right. Chaffetz does intend to investigate the Office of Government Ethics, which Republicans believe has been too outspoken in its concern over Trump’s conflicts of interest. So here, then, is Chaffetz after the 2016 election: planning investigations into those raising the alarm over Trump’s conflicts of interest, rather than actually investigating Trump’s conflicts of interest. Rep. Jason Chaffetz, about to hold a hearing on whether Hillary Clinton should have been jailed for her email server. There are obvious reasons for this. The danger for a House Republican in investigating Trump is that he’ll find something, and that something will be used by Democrats to win back Congress and, ultimately, the White House. Chaffetz is also ambitious to move up in his party — he ran for speaker of the House after John Boehner stepped down in 2015, and he knows that an overzealous investigation of a Republican president that puts both the Republican majority and conservative legislation at risk will doom his chances of future advancement. The Constitution assumes that human nature will push officials of each branch of government to jealously guard their own powers, creating a balance that prevents anyone getting up to too much mischief. But when elected officials are less interested in protecting their institution than in toeing the party line, it all falls apart. It is Chaffetz’s job, more than it is anyone else’s, to hold Trump accountable, to demand that he govern in a transparent and ethical manner. And he has the power to do it. He can subpoena administration officials and Trump’s business associates. He can make sure the media and the public have much of the information Trump refuses to release, and he can make it costly for Trump to abandon longstanding norms around transparency, divestment, and governance. The American political system is prepared for the sort of challenge Trump represents, and there are corrective powers in place. But the wielder of those corrective powers must want to use them. And Chaffetz doesn’t. His identity as a Republican supersedes his identity as chair of the House Oversight Committee, or even as congressman from Utah’s third district. This, and not Trump, is what poses a threat to American democracy. Here, in miniature, you can see the problem we face: not a president who can’t be checked, but a president whose co-partisans don’t want to check him. Partyocracy, not autocracy, is the danger. It is the danger now, and it is the danger in the future, when the presidency might be held by a would-be strongman smoother and cleverer than Trump. American politics is covered like an episode of The West Wing: The president is the main character, his top aides are the supporting cast, and Congress acts and reacts in the background. But the reality is much the reverse: Congress holds the bulk of the power, and the president and his aides must act and react in response to its whims. Trump can only pass the bills Congress sends him, he can only staff his government with the nominees they confirm, and even his executive actions routinely rely on authority Congress has handed over and could, at any point, wrench back. The president is weak but public; Congress is strong but often ignored. A recent poll by The Salt Lake Tribune and Hinckley Institute of Politics surveyed more than 600 voters, finding that 65 percent were in favor of Chaffetz investigating Trump’s conflicts of interest, while 31 percent were opposed, the Tribune reported. It’s worth noting that there are 24 districts held by Republicans that voted for Clinton. If Democrats won every one of those seats, they would take back control of the House. Congressional Republicans know they cannot simply ignore public opinion. What they are hoping is that public opinion ignores them — that those who are worried by Trump’s behavior disengage until 2020, thinking that there are no real remedies until the next presidential election. 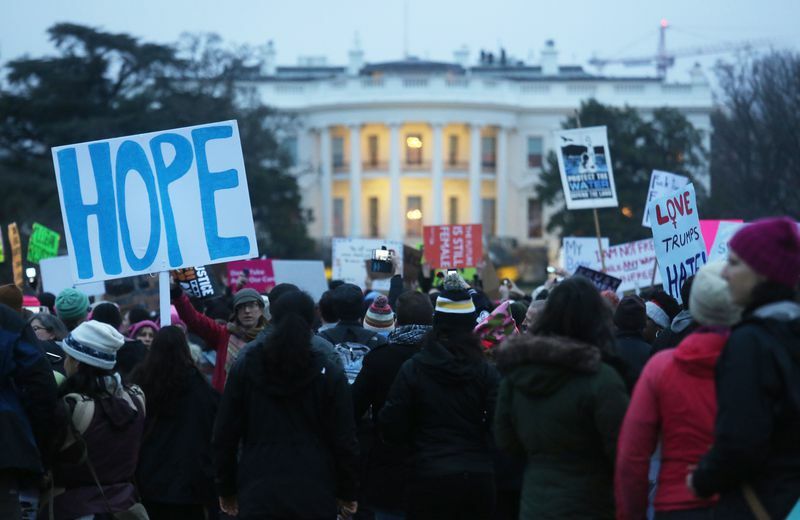 Protesters gather outside the White House at the finish of the Women’s March on Washington on January 21, 2017, in Washington, DC. The problem America faces right now isn’t what Donald Trump will do, but what Republicans in Congress will let him do. That is an unintuitive way to think in a polity that obsesses over the president’s every tweet but barely shows up to vote in midterm elections. But it’s the reality. This task is as urgent for Republicans as for Democrats — perhaps more so. In part, that’s true for reasons of legacy. 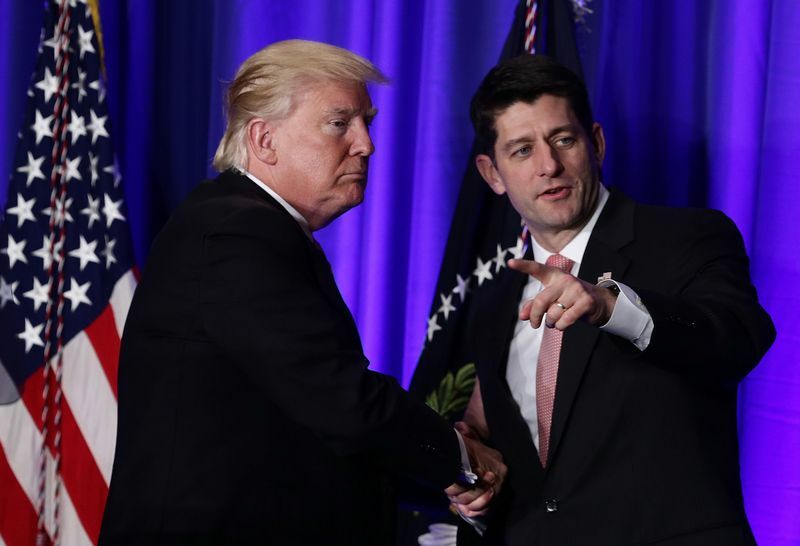 The history books will not speak fondly of Paul Ryan’s tax reforms if their cost was a presidency under which corruption flourished and crucial norms of governance and transparency were abandoned. But more optimistically, this is, for Republicans, a moment of opportunity. Nothing about the Trump administration is fixed. Few of his Cabinet officials have been confirmed. Few of his priorities have been chosen. Little about his relationship with Congress has been set. Both sides are feeling the other out. This is the point when they can set his presidency on a course that is safer both for them and for the country. Given Trump’s inexperience in government, it matters greatly what rules he believes himself to be operating under. If he can’t act unethically at an acceptable cost, he won’t. If he can’t confirm unqualified nominees, he will instead be forced to surround himself with qualified nominees. If he can’t govern without actually cutting himself off from his businesses, he will cut himself off from his businesses or hand the presidency over to Mike Pence, whom Republicans prefer anyway. If Trump’s worst instincts are curbed early, it makes it more likely that Republicans will pass their policies, and less likely they are eventually engulfed by scandal or incompetence emanating from the White House. But if Republicans in Congress abandon their constitutional role to protect their partisan interests, then they must be held no less accountable than Trump. There is much talk of the resistance to the Trump administration, and many protests happening outside the White House. But it is in Congress members’ districts — at their town halls, in their offices, at their coffee shops — where this fight will be won or lost. This is why it matters that the anti-Trump movement has begun adopting the tactics the Tea Party used to great success against President Obama in 2010: Those tactics focused on congressional offices, and that’s why they worked. They are working for liberals, too. Already, congressional Republicans are complaining that their phone lines are jammed, that their town halls are swarmed, that protesters are, as Rep. Dave Brat said, “in my grill no matter where I go.” And already, congressional Republicans are beginning to slow down on repealing Obamacare and peel off from Trump’s most unqualified nominees, like Betsy DeVos. But this is the beginning, not the end, of Trump’s opposition seeing Congress as the core battleground. The real test will be in 2018 — Democratic turnout tends to plummet in midterm elections, and overall turnout was historically low in 2014. The result, as political scientist Seth Masket writes, is that Republicans are more afraid of their primary voters than general election voters. Their behavior will change if and when that changes. And that should change. It should change in 2018, and it should change thereafter. Congress is more powerful than the president. It comes first in the Constitution for a reason. The public should demand more of it, and care more who runs it. But for now, the crucial question — the question on which much of American democracy hinges — is not what Trump does. It is what Congress does. The danger posed by Trump is one that America’s political system is built to protect against. But the officials charged with its protection need to take their role seriously. In the end, it is as simple as this: The way to stop an autocracy is to have Congress do its damn job.